Following on from my Compiling WSPR page, here is how to compile WSPR-X on Ubuntu (Debian and Mint also tested). 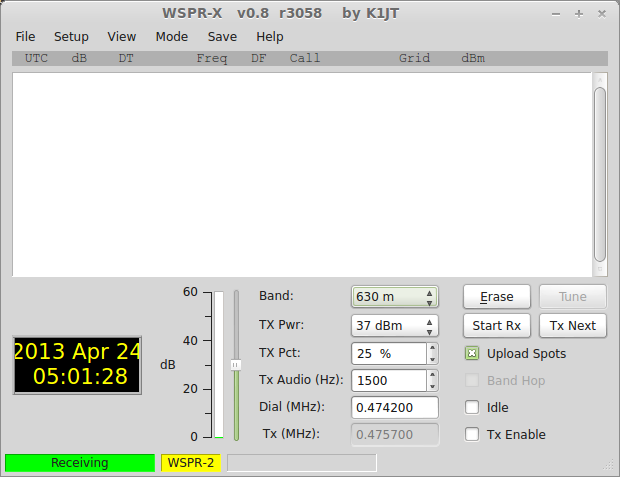 Now to download the WSPR-X source code. This is done by selecting the wsprx branch of the SVN tree. The version I checked out was 3205. The compile process is a little messy here. Several steps have to be repeated a few times. Special thanks to Aaron Brown for helping with this! The first thing to do is to build the libraries. Now, using an editor of your choice, you need to edit the Qt project file, wsprx.pro. Here, I use nano. To find a specific line in nano, use the combination Control+W (find) then Control+T (line). Edit the following two lines, removing the “-qt4” part. You should now see some other binaries, WSPRcode and wsprd inside the wsprx_install directory. Change into the wsprx_install directory and run wsprx and you’re away! And you should see it start! All that’s left is to put some signals into it, and see how we get on!